"This series of images was taken during May of 2014 in London and Paris. considering relationships between tone, value, and line, as well as time and place, I spent my days wandering and looking, finding moments containing these elements that collectively exhibited a sense of quiet stillness. In some images, such as the statues, trees, and buildings, time appears to be standing still. I have juxtaposed the stillness of these images with images of birds in flight, which reminds us that time is fleeting. They are mere moments that already passed, yet in actuality, all of these images live in the past. I chose to abstract the images through the use of black and white, removing them from the colorful world with which we interact, and allowing the formal elements to be more visible and accessible. It is much easier for us to perceive line, tone, and value when color is absent. This also allows form to supersede subject matter, which plays a secondary role to composition, lighting, and the formal elements. Several images were taken at the palace of Versailles in Paris, which, in modern times, represents opulence among poverty and the power of the people to overcome. but, it also brings attention to time past and present, much like photographs. We view these images today, now, but they signify a day that is no longer." Ryann Cooley is an award winning artist in both the fine and applied arts, working in the mediums of photography, video, sculpture, and installation. His work has been exhibited internationally, and is widely published. He holds a Bachelor of Arts from the Brooks Institute of Photography, and a Master of Fine Arts from teh School of Visual Arts in New York City. Ryann is also the Professor of Photography and Digital Media at Houghton College. Free and Open to the public, this collection will be on display at the studio from Mid June to Mid July 2017 during open studio hours. 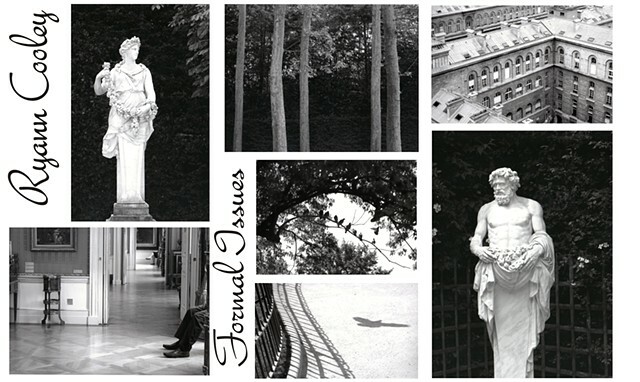 This limited edition collection of photographs is available for purchase. Contact information provided at the exhibit.